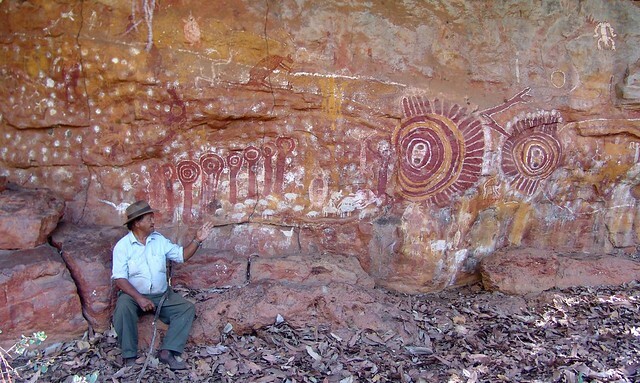 Editor’s note: The following post was written by David Lee, a rock expert specializing in the rock art sites of northern Australia. His Distinguished Lecture, co-sponsored by the Archaeological Institute of America Society – Houston, examines how the ceremonial traditions of indigenous groups in northern Australia are linked to lessons learned during the “dreamtime,” when the world was first created. Contemporary songs, stories, laws and ceremonies are informed by this ancient past and are still used to teach aboriginal children about their connection to the lands of their ancestors. Everywhere in the world that early humans found rocks, they left images carved and painted onto their surfaces. These images continue to inspire the curiosity and imagination of modern people, and researchers struggle to understand them. Unfortunately, any knowledge of the function and meaning of rock art has been lost across most of the world. 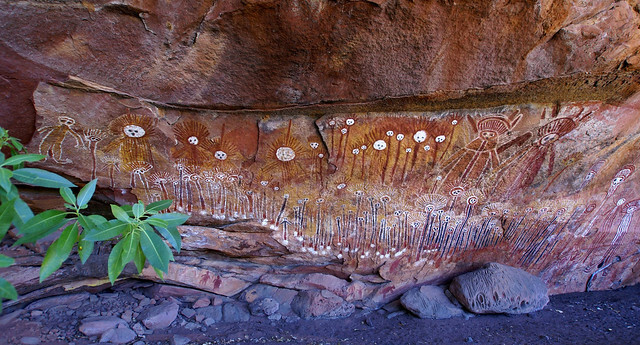 Northern Australia is one of the last places left where rock art is still a living part of indigenous culture. For the last seven years, I have studied with Yidumduma Bill Harney, the last fully-initiated Wardaman man and custodian of his people’s country, songs, and stories. Together we have documented 27 of the rock art sites in Wardaman Country along with all of Yidumduma’s knowledge about them. 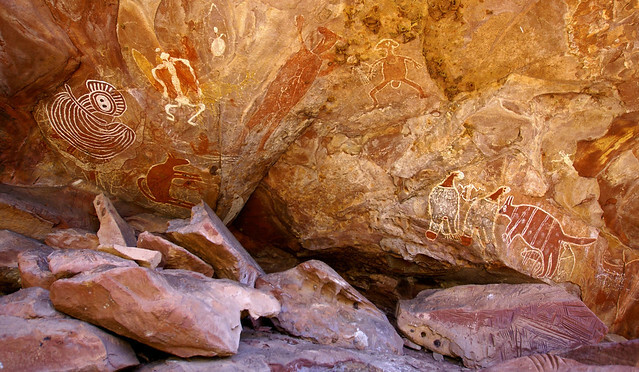 This knowledge provides many insights into how rock art functioned in the daily and ceremonial lives of early peoples. Yidumduma and the other Wardaman elders wish to see this knowledge recorded for their descendants and shared with the rest of the world. Wardaman Country is known as the Land of the Lightning People, where the Lightning Brothers fought, and where the Rainbow Serpent was killed, during the Creation Time. For the rest of the Wardaman creation story, you can visit my site here. To learn more about the preservation and ongoing research of rock art in the United States, go to Western Rock Art Research. When: Tuesday, Jan. 22, 6:30 p.m.
David Lee’s lecture is sponsored by the Archaeological Institute of America Society – Houston and the Apache Corporation.